In today's scenario of globalization and technology convergence, the process of doing business has been redefined. Outsourcing various processes makes a lot of business sense. Most businesses and large companies are outsourcing their Accounting processes and Regulatory Compliances for better management of their time and finances. The service involves preparing and maintaining day to day bookkeeping and monthly or quarterly management accounts. These books are prepared as per the accepted accounting standards and can also be made as per specific client instructions. The service involves preparing and maintaining day to day bookkeeping and monthly or quarterly management (MIS) Reports and other business accounting services. We also provide services specific domain wise as well like – Accounts Payable, Accounts Receivable, Various Reconciliations e.g. Vendor reconciliation, Clients reconciliation, Bank reconciliation, Inter Co. reconciliation, Branch reconciliation etc. We prepare / maintain these books of accounts as per the accepted accounting standards and can also be made as per specific client instructions. 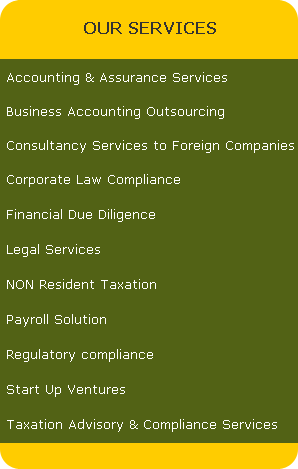 The service involves to provide assistance like preparation of various details and schedules as required by the Statutory Auditors and mandatory in nature as per the applicable Accounting Standards during statutory audits of the organizations, preparing the company's final annual accounts and schedules ready for the statutory annual audit. Our objective here is to arrange the financial affairs of our clients in such a manner so as to optimize their taxes to the maximum possible extent. We structure investment decisions to meet dual objectives of capital appreciation as well as optimization of tax liability. We analyze the funds requirements of our client’s business and by doing a cash forecasting and make sure that adequate funds are available when required to ensure business cycle continuity. Analyzing the potential risks in advance. Correct interpretation of the company's financial position. Informed and better managerial decision making. Collection, summarization, and accurate analysis of financial data.